Two crusades were held in General Santos City. First, the ShareHim Crusade, which was composed of Americans and Filipinos from the USA. This crusade was held in different venues in General Santos City and neighboring districts in the city. After the crusade, more than 1,000 (one thousand) souls were baptized. The adopted ministers of SMM did the groundwork of the crusades. 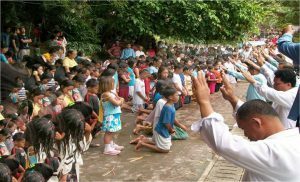 NOTE: This year of 2011, as of April 30, Southern Mindanao Mission has already baptized 3,350 precious souls with the adopted ministers assisting. Praise the Lord! Right after the ShareHim crusade, our groundwork for the McKenzie Crusade followed. And before the crusade, we had conducted our own satellite crusade where I was the speaker for the 11-night series of meetings. My co-adopted ministers assisted me during that satellite meetings. There were a few more satellite meetings besides ours, also held by adopted ministers. After having our own satellite meetings, the Main Crusade was held at City Central Church from April 8 – 23, 2011. The speakers of this crusade were Mr. Ed and Mrs. Ruth McKenzie, evangelists from Washington, USA. This crusade was entitled “All for Jesus” and this was conducted for 16 nights. The McKenzies sponsored the crusade. Last Sabbath, April 23, 2011 after the Divine Worship, we proceeded to LC 5 Resort where there were 304 souls baptized. And there were 14 pastors who performed the baptism. In this baptism, my partner, Arnold Batbatan, and I recommended 21 souls. After the baptism we posed with Mr, & Mrs. McKenzie. 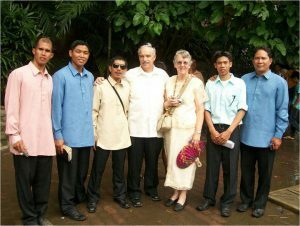 In the picture from left to right are adopted ministers: Emmanuel Lanistoza, Arnold Batbatan, I, Ed McKenzie, Ruth McKenzie, Jasper Almocera and Pedro Casio. Our companions who were not in the picture are Alex Cordero, Jezreel Abella, Emer Casas and Reynante Maguimpa. What a joy because we all know that the work of the Lord is very progressive here. This is just a sign that His coming is very, very near. There are more crusades coming and we will be assisting them. We are so grateful to the sponsors of Adopt a Minister Int’l for your prayers and financial support. Best regards to all of you. God bless and more power.